Restaurant review: Another Chattanooga barbecue restaurant? Yes, please! › Where: Jim ‘N Nick’s Bar-B-Q, 2040 Hamilton Place Blvd., Suite 150. 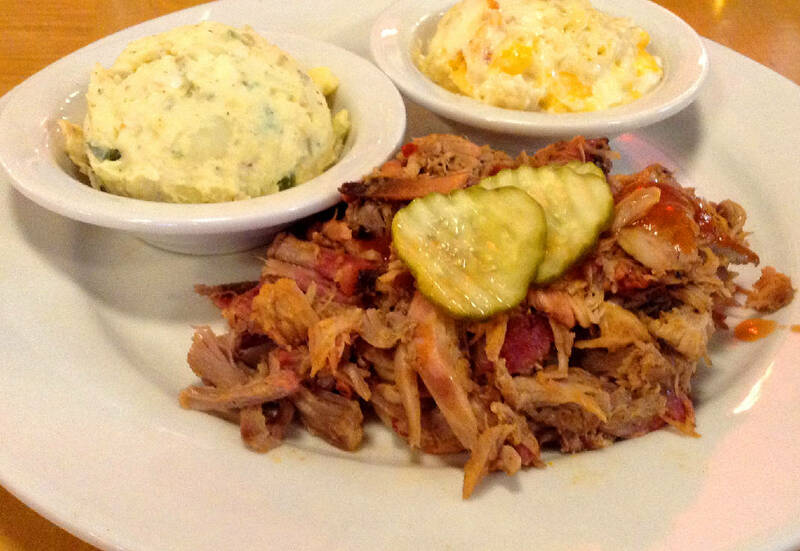 You can hardly throw a rock in metro Chattanooga without hitting a barbecue joint these days. I've had a long-standing affinity for this most patient of culinary arts, so the abundance of choices is fine by me. It is the South, after all. Chattanooga might not have the smoking reputation of Memphis, Kansas City, Missouri, or Austin, Texas, but mom-and-pop pitmasters work their magic in every corner of the city, while regional chain eateries that have gotten barbecue down to a science have found crowds of enthusiastic diners here, too. 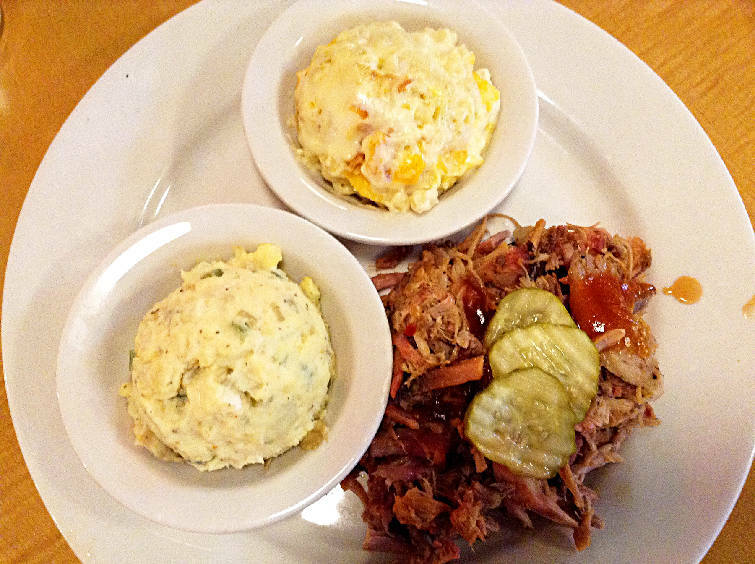 Jim 'N Nicks Bar-B-Q falls into the latter category. But just because the place sits right in the midst of a bustling Chattanooga retail hub and has a corporate portfolio that includes more than 40 locations throughout the Southeast doesn't mean there's not a commitment here to authentic craft and customer service. This Birmingham-based chain's pitmasters are serious about low-and-slow smoking. Jim 'N Nick's recently opened in the former Fox & Hound Pub & Grille space near Hamilton Place mall. It's difficult to make much of a visual impression amid the sprawl of retail shops and restaurants that surround Hamilton Place, but it's also hard to miss the huge stack of wood out front that fuels the smoker. The ample dining room, which can seat more than 200, features a mix of high-back wood booths and open tables in a comfortably lit, rustic, dark-wood setting, while the bar is a good, roomy spot to watch college football and partake of numerous domestic, craft and import beer choices — or something stronger. One thing that sets this place apart from most eateries of its size and concept is the convenient drive-thru window. 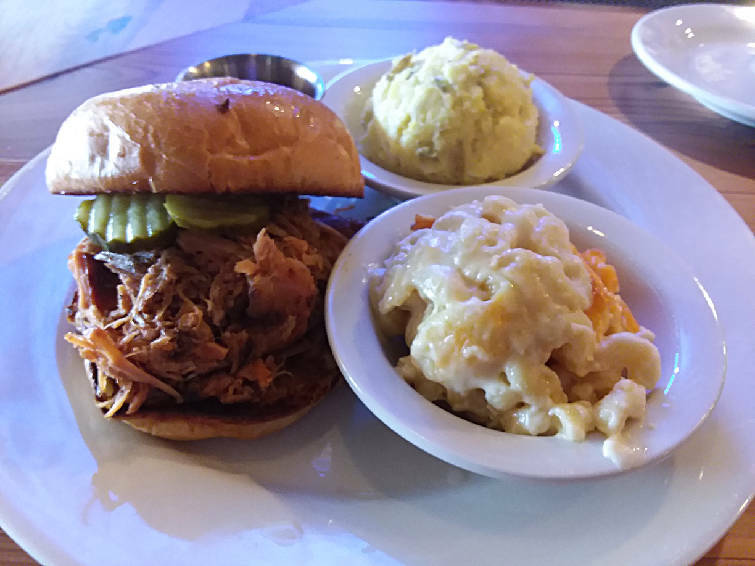 Pulled pork, beef brisket, hot links, barbecue chicken, smoked ham and baby back ribs anchor the menu, which also includes dinner staples such as steaks, burgers and Southern comfort favorites like pimento cheese sandwiches and fried catfish. A variety of salad options gives the lunch menu a lighter touch. Lots of small plates, including smoked buffalo wings, deviled eggs and smoked pork hot link, and some scrumptious-looking dessert options, such as banana pudding, round it out. I don't typically visit restaurants more than once when writing about a dining experience, but I changed things up this time and visited Jim 'N Nick's twice. I met my friends, Travis and Bert, there the first time and, although I mostly liked the food a lot, the place was busy toward the end of a Sunday lunch rush and I didn't particularly enjoy sitting near the constant clamor of the kitchen. We ordered the smoked riblets small plate ($7.49) to get things started. I then opted to try the classic pulled pork plate served with Carolina Bar-B-Q sauce and sides of mac and cheese and potato salad ($13.99). Bert ordered the smoked ham ($13.99) and Travis chose the open face beef and gravy ($9.99). I did not care much for the riblets; I found them a bit too small to handle with a lot of dense fat. The pulled pork plate, on the other hand, was expertly prepared and the sides were flawless. The smoked pork shoulder was fork-tender, as it should be. The creamy mac and cheese had just a hint of crust, and the onion and pickle bits lent the potato salad just the right savory sweetness. Travis and Bert liked their choices, too. The basket of complimentary cheese biscuits that our server, Elizabeth, brought out were moist and tasty. On my follow-up visit, I came alone and sat at the bar, which was not crowded on a late Sunday afternoon. I essentially ordered the same thing as before to gauge the place's consistency, but scaled my order back to a pulled pork sandwich, the Pig On a Bun, instead of a plate and got the same two sides ($11.99). All of it was every bit as good as on my initial visit. Although there are other menu items that I wouldn't mind trying, I think the pulled pork, mac and cheese, potato salad lineup will be my go-to at Jim 'N Nick's. I received good, attentive service with reasonable times for the food to arrive hot and fresh on both visits. Because of the near-constant traffic, I tend to avoid the entire Hamilton Place area most of the time. However, I can imagine putting that aversion aside on occasion to visit Jim 'N Nick's for some very good barbecue. Some things are just worth the hassle. Contact Chris Zelk at czelk@timesfreepress.com.